Cold Brewed Coffee – Worth the Wait! Latte, espresso, macchiato, Americano….just when you thought you tried all our options, we are pleased to announce that Cold Brewed Coffee has come to Take Five Cafe! What is cold brewed coffee? Well, to start, it is not iced coffee! 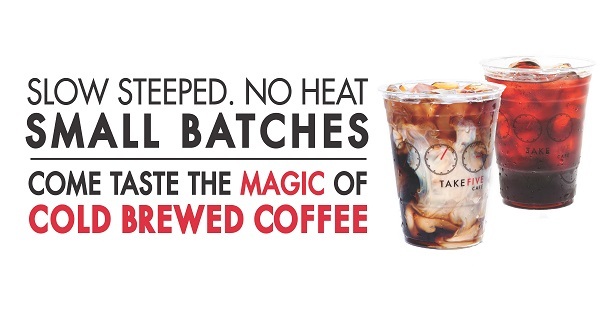 To create our Take Five cold brew, ground coffee beans are steeped in cold filtered water for 24 hours. Yes! 24 Hours!! The extended brewing time allows for the flavour of the coffee to be extracted from the beans leaving bitter compounds behind. As a result, cold brewed coffee seems sweeter producing an extremely smooth, flavourful cup of highly caffeinated coffee. They say good things come to those who wait + when Cold Brewed Coffee is properly steeped over a longer brewing period the results are magic! Cold Brewed Coffee can be served over ice, or steamed until hot. When the cold brew is steamed, it activates the oils in the coffee + pours as creamy foam with an equally creamy, unique flavour. Flavours can also be added creating some delicious variations like Caramel Truffle, Tuxedo(coconut), French Vanilla + more. We think Cold Brewed Coffee taste exceptional + hope you do too! Curious? Come visit us + give Cold Brewed Coffee a try. Now served at all of our nine locations.